The Wonder Cam WS-201 is a tapeless digital camcorder utilizing flash memory cards to store video, still images, MP3 and audio recording files. 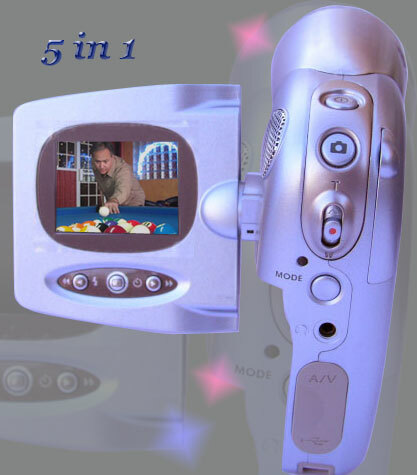 It is the best 5-in-1camcorder in the world today. It delivers a superb VGA (640x480) quality at 28 frames per second (FPS) by using MPEG-4 compression technology. The resolution is very close to DVD or DV at 708x480 at 30 FPS. Never worry about storage limitations. The SD card slot creates infinite capacity. Wonder Cam is made by the same company that manufactured the ViviCam and Konica digital cameras. This is the best new concept 5-in-1 tapeless digital camera/tapeless camcorder/PC Web Cam/MP3 Player/Digital Voice Recorder of this kind. MP3 players are hot and this would be a great Christmas gift. It is attractive, small in size, fitting easily in your hand. We guarantee it takes better pictures and video than the other leading competitor, the Panasonic D-Snap SV-AV50 ($399) 4-in-1. SV-AV50 can record on only QVGA (Quarter VGA at 320x240) which is 1/4 of the resolution of this camcorder. The Wonder Cam has respectable digital picture quality and video quality. It is about the best quality for a MPEG-4 tapeless camcorder. It has lower MPEG-4 video antifact than most leading competitors. * Similar devices on the market either have a low frame rate at 10-15FPS making the video very choppy and unwatchable, lower QVGA resolution (320x240), or a lot of MPEG-4 digital compression antifacts. Those antifacts include sudden shifting of colors, picture drop out, and unexpected change of exposure. They happen when the picture scene is moving. The Wonder Cam is one of the best when it comes to controlling MPEG-4 compression antifacts. It is free of digital compression antifacts in most situations. You can download thousands of MP3 music files from the Internet for free or for a fee, save them onto an SD card or the internal 64MB memory through USB and enjoy your own music files with the provided headphone. You can mix all MP3, voice, photo, and video files within the same SD card and recall them by type through the menu. Included: Brand new in box including the CD with driver and software, camera case (with logo), hand strap, 2 AA alkaline batteries, stereo headphone, USB cable, AV cable (for TV), mini-tripod. Sold on American Shopping Network for $299.95 (Dec. 2005). Advantages: It's a third of the size of the smallest digital MiniDV camcorder costing over $1,000, and tapeless portability allows you to capture MPEG-4 video anywhere. There is no more excuse not to take your camcorder with you. After you drag-and-drop your captured video files onto your desktop you can watch, edit, and even e-mail them to your friends. With the included WinDVD software and a PC with DVD recorder, you can edit and burn your video collection onto a DVD. Best of all, it is also a 4 Mega Pixel digital camera, an MP3 player and a digital voice recorder. You can download MP3 songs from the Internet, save them onto a SD card and listen to them through the Wonder Cam. You can also go into a meeting with this camcorder and record entire conversations. All four different types of files can be mixed to be recalled with the On Screen Display. It can directly hook up to a TV to view or playback all 4 types of files instantly. In addition, you can hook up to a PC through a USB cable and Wonder Cam becomes a Web Cam. The Wonder Cam WC-201 is attractive with a slinky round metal body. It is easy to use, with separate shutter releases for stills and video, and no confusing modes to swap between. The 1.5-inch flip out screen is sharp and can rotate 270 degrees. It uses inexpensive AA size batteries. It captures up to 4-megapixels snaps (with flash) with good colors and plenty of detail. MPEG-4 video is colorful, well exposed and has more detail than from cheaper VHS-C or 8mm camcorders. What is MPEG-4: MPEG-4 is an ISO/IEC standard developed by MPEG (Moving Picture Experts Group), the committee that also developed the Emmy Award winning standards known as MPEG-1 and MPEG-2. These standards made interactive video on CD-ROM, DVD and Digital Television possible. MPEG-4 is the result of another international effort involving hundreds of researchers and engineers from all over the world. MPEG-4, with formal as its ISO/IEC designation 'ISO/IEC 14496', was finalized in October 1998 and became an International Standard in the first months of 1999. The fully backward compatible extensions under the title of MPEG-4 Version 2 were frozen at the end of 1999, to acquire the formal International Standard Status early in 2000. MPEG-4 provides the standardized technological elements enabling the integration of the production, distribution and content access paradigms of the three fields below. It is the highest level of video compression standard today. The advantage of MPEG-4 is that it has smallest file size for the same video that is more suitable for email and storage with a flash memory. Since MPEG-4 video is highly compressed, it requires a very fast image processor to capture and compress the video into this format. It is the best format for emailing video to your friends because of the smaller file size. Product comparison: Tapeless camcorders are a very new concept. 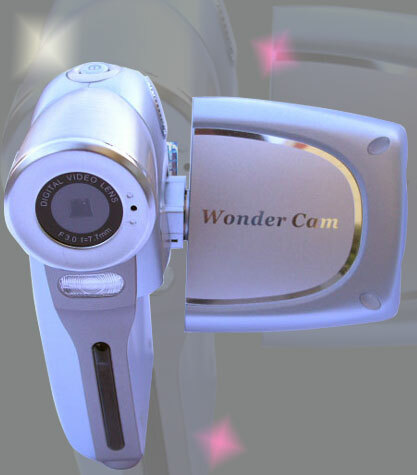 Wonder Cam WS-201 is the best 5-in-1 camcorder in the world in as of 2004. The other leading 4-in-1 camcorder is the Panasonic D-Snap SV-AV50 ($399). However, SV-AV50 can record on only QVGA (Quarter VGA at 320x240), which is only one quarter of the resolution of the Wonder Cam WC-201 VGA quality. Other less common devices like Mustek and Aiptek are all QVGA camcorder with plastic exterior. Therefore, Wonder Cam WC-201 is clearly in a one horse race for the 4-in-1 camcorder/camera/MP3/digital voice recorder. Many higher end digital cameras can also record short clip of videos. However their videos are mostly QVGA resolution or VGA at very low 4 to 15 FPS in the less compressed AVI, Quick Time, or motion JPEG mode. You can record much less video on a memory card of the same size. The 4 to 15 FPS video is very choppy. They are less desirable to use as a camcorder.